Jack Lee, MSc (Physiology and Pharmacology) is determined to take an innovative technology which helps patients with tremors, and bring it to market. And he's finding a lot of people and resources, to help him achieve that goal. Earlier this month, Lee was awarded an Entrepreneurship Fellowship from the Ontario Centres of Excellence (OCE) and the Ontario Brain Institute (OBI). The one-year $50,000 award is one of eight handed out to post-graduate students to support commercialization of discoveries that help diagnose, treat or cure brain disorders. The new technology was developed by Dr. Mandar Jog and Fariborz Rahimi, PhD, of the Movement Disorder Clinic at London Health Sciences Centre. Lee joined their laboratory in September on a Graduate Enterprise Internship Initiative from the Stiller Centre for Technology Commercialization. "Tremors are the most prevalent of all movement disorders," explains Dr. Jog, Neurology Professor at Western's Schulich School of Medicine & Dentistry, Lawson Health Research Institute Scientist and Director of the National Parkinson Foundation Centre of Excellence. "This new technology helps to analyze the limb motion and unique tremor characteristics in each patient, helping to guide neurologists in reducing tremors." "In the 50 patients we've tested, we've been able to reduce the tremors by 70 to 80 per cent," says Lee. "The next step is to work with OCE/OBI to apply for more funding from the government, as well as getting Health Canada and FDA approvals for the technology." The injected medication is already approved in both countries for other uses. "Jack's significant contribution is to light the fire to take this further," says Dr. Jog. "We needed someone with the expertise, the know-how and the interest. It takes a young enthusiastic entrepreneur-type to develop this into a corporate structure where he can grow, and make us grow." commercialization of this research and turn it into start-up companies,"said Dr. Tom Corr, President and CEO of OCE. "Together, we are fostering a new generation of neuroscience entrepreneurs." Dr. Donald Stuss, President and Scientific Director of the Ontario Brain Institute adds, "Through this program we aim to encourage entrepreneurial spirit and expand the career opportunities for our highly‐trained neuroscience researchers here in Ontario." The global market for diagnostics and therapeutics related to brain disorders is estimated at $140 billion and growing. 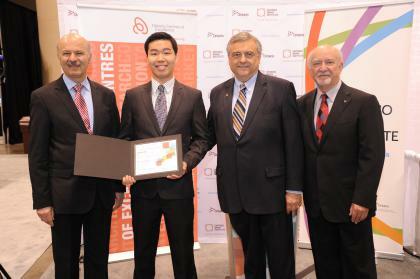 left to right, Dr. Reza Moridi, Minister of Research and Innovation, Jack Lee, Fellowship recipient, Dr. Tom Corr, CEO, Ontario Centres of Excellence, and Dr. Donald T. Stuss, President, Ontario Brain Institute.